The â€œHuman Rights Watchâ€ Middle East director says that â€œISIS is carrying out a vicious campaign against minorities.â€ He says that being a Christian, among other groups, can cost you your livelihood, you liberty and your life. Kirsten Powers talks of the Muslim saying, â€œfirst the Saturday people, then the Sunday people, meaning first kill all of the Jews then all of the Christians.â€ She says Christian martyr deaths have doubled in the last year. She sees the greatest issue as getting these people resettlement and humanitarian aid, as they have lost everything forever. She also recognizes the negative influences of Saudi Arabia as being a key influence in the tyranny. 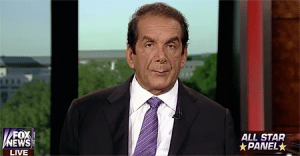 Charles Krauthammer asks where is Obama on this issue? He claims that we must be respectful to Muslims, yet he is mute on this tyranny.